Hellebores have always been a favourite choice for the English gardener, the most popular by far is the Helleborus niger– one of Britain’s oldest cultivated plants and believed to have been introduced the Romans. They belong to a small genus containing 20 species of hardy evergreen and deciduous perennials, and although they are almost solely grown for their ornamental value they also make excellent, long-lasting cut flowers. Apart from a few exceptions, most hellebores will grow quite happily in the shade. They will also appreciate plenty of organic matter such as moss peat or leaf mould mixed into the soil before planting – this can be topped up with fresh mulch every spring. If you are designing a group planting scheme then set the plants about 12-15 inches apart, but if you have a choice plant them into a deep, fertile, well draining but moist soil. If possible the soil should be either neutral or slightly alkaline, but they can tolerate acidic soils if necessary. Position them into a site with partial shade or preferably under deciduous trees, as this will allow them to receive sunlight in winter. However make sure that there is some protection from strong winter winds. 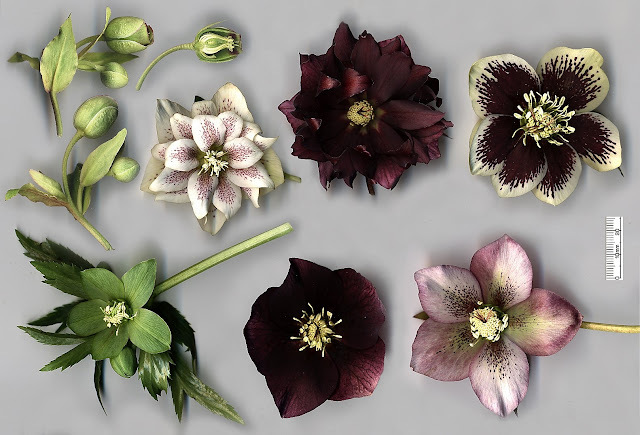 All varieties of hellebore prefer a sheltered position away from the effects of cold winter winds that can damage emerging flower buds and leaves. For early bloomers you may wish to protect them with a Victorian style bell cloche. Most deciduous Hellebores will keep their old leaves in place throughout the winter, but when new buds start to appear it’s a good idea to cut them off. Not only will this encourage new growth to form, you will also get an uninterrupted view of the newly emerging flowers. The best time to plant helleborus around October, placing the into a partially shaded site with a deep, moist yet free draining soil. If you have a heavily shaded area then consider planting H. foetidus as of all the hellebores this species will be the most tolerant. Once planted they prefer to be left undisturbed.